2 bed 1.5 bath home on private leased land, perched atop the cliffs of Labufadora. LandRent is $275/month above the cost of buying the house, but the house belongs to you. View the famous blowhole from your armchair. 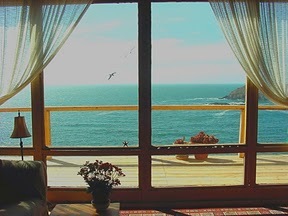 Watch gray whales swim by & dolphins and seals play below in the cove. Watch stunning golden sunsets at dusk. Hear Mariachi music across the bay from the restaurants. Enclosed courtyard, VERY private, no thru traffic. Free private boat launch & private beach within walking distance; where you can fish, swim, snorkel/scuba dive or just enjoy the sunshine. Seperate palapa garage with workshop, workroom and car/boat storage. Private driveway, laundry room, and beautiful landscaping with bloomimg color all year long. New deck, new kithen/bath floor tile, brand new pila (water storage). See below the picture for more pics and information.